Compact and portable this great little kiln for just about anything that can fit on the 8" x 8" shelf. The interior measures 9" wide x 9" long x 9" deep. This kiln is side firing only. The kiln can be three piece or can be all attached with a hinged lid. 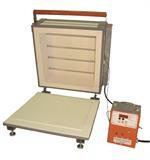 This kiln can also be converted to a vitrograph kiln with the kiln with a hole bottom. The Cube is great for metal clay, fusing glass jewelry, glass bracelets, enameling, ceramics! The take-apart version is shown with the hinged lid and attached base available. Please specify when ordering. 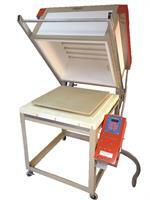 This kiln comes standard with the AF3P Orton digital 3-button controller. Ships UPS. Interior Dimension: 9" width x 9" length x 9" depth. Interior Dimension: 9" x 9" x 9"